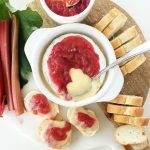 Make this Baked Canadian Camembert with Rhubarb Compote as a quick and super delicious appetizer! In a small saucepan over low to medium heat, add the chopped fresh rhubarb and sugar. Cook until the rhubarb mixture is the texture of a soft jam, about 10-15 minutes. Stir in the cointreau and cook for about 1 more minute. Remove from the heat, and set aside to cool slightly. Place the Camembert cheese in a brie baker. Add a generous amount of the rhubarb compote to the top of the cheese wheel. Cover and bake for about 20 minutes, or until the cheese is as soft as you would like it. Serve warm with crackers or chunks of fresh baguette. This recipe makes about 1 1/2 cups of rhubarb compote. You will have a lot left over, but you can enjoy it on toast or vanilla ice cream!